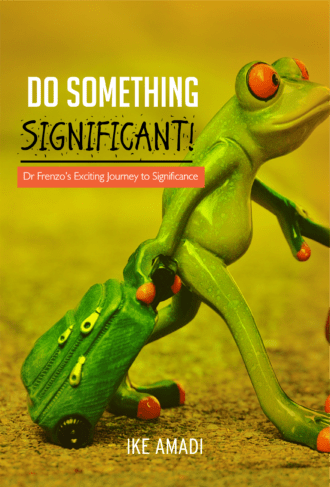 Do Something Significant is a pragmatic and stimulating take on personal development from the perspective of a mindful and energetic go-getter and his astute mentor. In the second installment of the Do Something series, Ike Amadi shares his transformative experience as a National Youth Service Corps (NYSC) member in Nigeria, and a series of awe-inspiring wisdom keys from mentoring sessions with thriving business consultant and strategist, Dr. Frenzo Adeniyi Onamusi. In five concise chapters, Ike Amadi insightfully examines and answers the questions, “What is significance?” and “How can I do something significant?” using his personal journey towards development, and a bridge of learning experiences guaranteed to empower the reader’s ability to make unequivocal strides in the areas of spiritual, personal and professional development. It’s a must read for people of destiny seeking guidance on how to convert God’s vision for their lives into a reality. Do you know exactly what you want? Or are you going to settle for anything life presents you? There is so much theory out there but Do Something! has one purpose – to instill the ‘Do Something!’ consciousness in you; to help you convert the theory you know into practice. This book will inspire you to make an effort to become a better person than you are and will give you the energy and motivation you need to go through life smiling. ‘Do Something!’ is meant to excite your mind, enliven your bones and light up an unending fire in your heart towards pursuing whatever thing you have dreamt about or left undone. At least that is what the book did for me when it was being written and still do when read.